It's that time of the year... Purim is just around the corner! Purim is a Jewish holiday similar to Halloween. Kids dress up in costumes and people give basket with treats to each other. 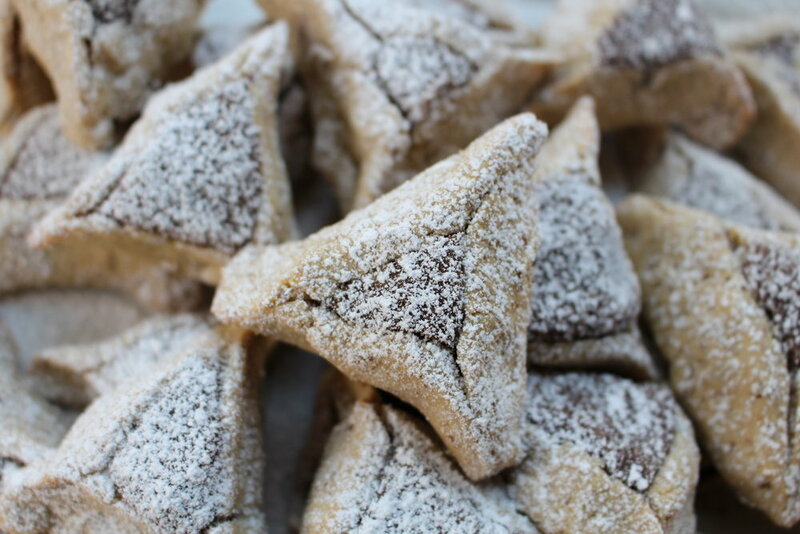 Hamentaschen are the traditional Purim cookies, and this is a wonderful recipe for these soft cookies that literally melt in your mouth. No white flour is used--only healthy flours like almond meal and spelt flour--so feel free to indulge yourself in this treat and share "mishloah manot" on a healthy note. Use your favorite jam, or chocolate and enjoy the holiday. Put the chocolate, vanilla oat milk, cinnamon, and sugar in a glass bowl and microwave for a minute. Mix well and set aside. Add the dry ingredients to the food processor--flours, sugar, baking powder, and salt--and pulse a couple of times. Then add the wet ingredients: coconut oil and milk. Mix until combined. Dust your working surface with flour and roll the dough into a thin (1/4 inch) layer. Use a round cookie cutter--I used 2 5/8" diameter or 68mm. Makes about 14 raspberry cookies and 12-14 chocolate cookies. Take a spoonful of the filling and put it in the center of each circle. Then pinch together one side, and then fold in the other 2 corners to create a triangle. You can close it on top all the way, or you can leave it open at the top- it's up to you. Bake in the oven for about 10-15 minutes--until golden brown. Let it cool down completely. Sprinkle with powdered sugar and serve.